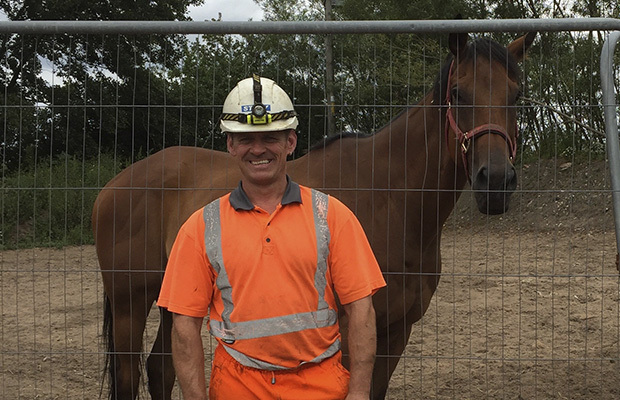 Story Contracting and Story Homes have helped to create a pasture for rescued racehorses including one once owned by a former England footballer. The sister companies supplied and delivered 140 tons of top soil and then levelled off the area at Carlisle’s Racehorse Rescue Centre after the pasture was ruined by flooding. The area will be used as a ‘chill-out zone’ for the eight animals at the centre so they can socialise, recover from injuries, graze and learn to become equine therapy horses. The top soil was brought to the site from Aspen Grange, a housing development being built by Story Homes on Kingstown Road in Carlisle and where Story Contracting is carrying out the groundworks. A 16-ton excavator, driven by Story Contracting’s client relationship manager Angus Irving, was then used to cover the uneven field before it was levelled off. The area will be re-seeded. The centre re-homes vulnerable or unwanted racehorses and runs free programmes for veterans, the disabled and troubled young adults to help build confidence and educate them in animal welfare. One of the horses at the centre, Switcharooney, was once owned by former England, Manchester United and Everton footballer Wayne Rooney, who is now plying his trade in America. Sarah Davies, charity guardian for the centre, said: “All this work will help the horses and the people who use them. “We noticed you had a lot of top soil at Aspen Grange and because we were aware of other work you have done in the community we thought we would ask for your help. “When the floods happened in 2015 it washed a lot of the soil away and we ended up with a great big swimming pool out there.